TSM gets lost walking to tournament site in 19 degree (F) weather. They tried to cross 4~6 lane highway to get to tournament site but apparently decided it was probably a bad idea. Probably should have taken a taxi. TSM steals wraiths. TheOddOne starts at Crs Red, SYTDKO takes TSM's blue. Chaox/Xpecial pushing in bot lane hard. SYTDKO hits level 2 and goes straight to gank The Rain Man top, Irelia gets zoned out of lane. Skarner goes to his own blue, teamfight breaks out, but nobody dies at Crs blue. 11:00 Skarner spends a full minute camping bottom, Xpecial tries to bait while TheoddOne comes in, but Wukong TPs in bottom. Leblanc tries to counter gank bot. Sona + Rammus Die on TSM, Vayne dies on Crs. Irelia + Cassiopeia arrive late. 13:00 Crs goes for Dragon and takes it for free. 14:30 Rammus ganks Cassiopeia trying to ward river, takes free flash off Cassiopeia. Leblanc gets blue. Skarner camps top for half a min, fails gank. Chaox 140 cs vs Vayne 82, takes down bot tower. 16:20 TheRainMan takes down top turret. 17:00 TSM takes mid turret. 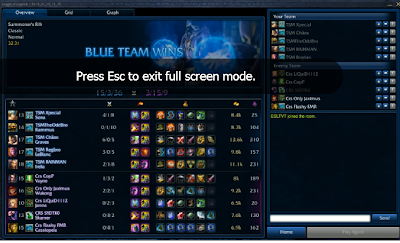 18:20 Crs gathers at Baron, Janna/Sona have Oracle. TSM gathers at Dragon. TheRainMan kills Wukong top lane. Skarner steals Dragon. Skarner, Janna, and Vayne die from Crs. 20:20 TSM takes second bot tower. - Gold: 28.8k VS 25.2k gold. 22:20 CRS gathers at baron, TSM Sona clears wards, rest of team pushes all lanes. 23:00 Janna gets caught by Irelia and dies. 24:20 Wukong jumps into Baron, gets Taunted by Rammus and has to flash out, Skarner dies trying to smite, TSM picks up baron. Irelia dies, Cassiopeia dies. TSM takes down second mid turret and Dragon. TSM using double Shurelya's on Rammus + Sona. 26:40 TSM takes bottom inner turret + bot inhibitor. ** Big Highlight, must see when watching video replay! 31:40 TSM starts farming their base, takes top tower, inhib, their nexus, their souls, etc. They're looking at M5 as the biggest challenge after M5 said "We're only scrimming TSM to get viewers"
Says SK not as strong a competition as M5. Says "M5 is going down in the finals." Confirms TSM move to EUW servers to improve gameplay. "Saving special tactic for M5 in the finals"
Some of your info is wrong. 24:20 Crs jumps into Baron, Skarner dies, TSM picks up baron. Irelia dies, Cassiopeia dies. ^Wukong is the one that jumps in and essentially suicides with his ult, barely doing any damage to baron and only hitting Rammus. 31:00 Chaox sells Phantom Dancer, buys Wriggles Lantern. Sells Doran's Blade, buys another Phantom Dancer. - Trolled. ^He sells his phantom dancer, probably by accident, for a Quicksilver Sash. Realizing he sold PD instead of his Doran's Blade, he re-buys Phantom Dancer. He already had Wriggle's Lantern. Just checked up on SK's recap on the game since I remember Wukong did flash in with his ult, but didn't die. Apparently he jumped in with his ability, ulted, then flashed out after he got taunted by Rammus. I remember Skarner and Cassiopeia were the only ones that died on Crs. I'm pretty sure one of the announcers was joking about Chaox getting a wriggles lantern and said something like "wow, 30 minute wriggles lantern, sounds very strong" "Guess he was like well I sold it, but I have so much gold, guess I'll buy another one"
Found the video :) He actually buys a p-dancer, then a wriggles, then sells p-dancer, buys a quicksilver sash, then sells a doran's and buy's a p-dancer. on some normal issues, The site taste is ideal, the articles is in point of fact great : D.
The first thing that you will ntice with ecigarette users is their oral wellness. to give up smoking andd nicotine entirely. if satisfied. A lot of times throughout the U.
Wow! After all I got a website from where I be capable of truly get useful facts regarding my study and knowledge.